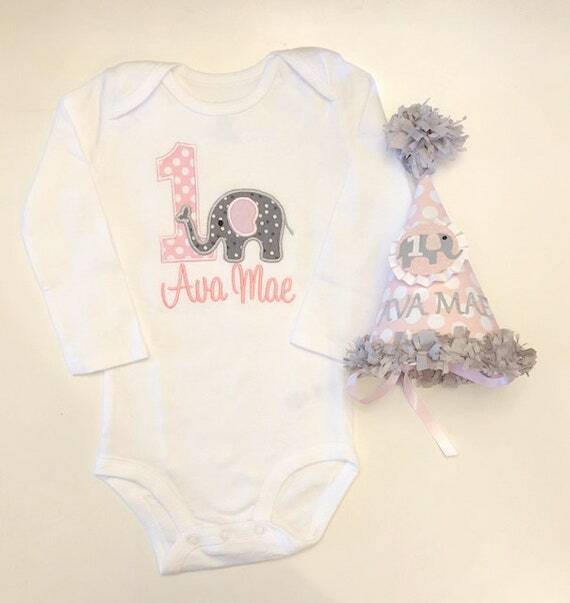 This adorable elephant 1st birthday personalized party hat and matching bodysuit or shirt set is the perfect way to say I'm turning one today! The perfect set to celebrate your little girl turning one. This set comes with a personalized shirt and or bib and matching party hat. The shirt is embroidered with a light pink polka dot number 1 and an overlapping grey elephant (choose from 2 style elephants). Her name is stitched below in a coordinating pink. Please let me know the name you would like when you check out. Soft mesh covers the back of the embroidery design to protect your little ones sensitive skin. Please see sizing chart in 4th photo to determine the best fit for your child. Prefer a different font for her name? No problem! Just let me know which font choice you want in the sizing chart. Carters Brand is used for bodysuits and available in sizes 6m, 9m, 12m, 18m, or 24m. Blanks Boutique or ARB Blanks are used for shirts and available in sizes 6m, 12m, 18m, 2T, 3T, 4T, 5T, 6, 8, or 10. They have ruffles on the sleeves and bottom of shirt. The hat was made out of high quality cardstock and digital patterned paper. The tissue paper fringe and topper were made by hand. The elephant was diecut, and the ear and number 1 were covered in glitter. It is then attached to a circle that was embossed with tiny dots and to a handmade medallion. A diecut and glittered name is added below. Satin Ribbon was added on each side and ties around the chin or back of the head to keep the hat on. If you need more than one contact me for pricing and a custom listing. I can make these outfits in other colors, crowns instead of hats and with different numbers too as well as for different themes. If you need a size not listed contact me for more details.